Cardboard is the one of the most popular packaging materials in use today, and the most well known is corrugated cardboard boxes, and we don’t expect that to change anytime soon. It’s lightweight, strong and resilient, offering excellent protection for almost any item. But did you know that it’s corrugated cardboard that gives boxes their strength? Today we’re focusing on precisely that – the material that gives corrugated cardboard boxes their superior strength and resilience. In this post we’ll be covering everything corrugate related, including how cardboard boxes are made, when corrugated cardboard was invented and how it works, as well as tips on recycling; how to shred, cut and dispose of corrugate. First we’ll start with the basics – just what is corrugated cardboard? Put simply, it’s the thick, strong arrangement of card that makes up the walls of a cardboard box. It’s this combination of materials that gives cardboard their high strength and resistance to bumps, knocks and crushing. The cardboard that makes it up is arranged in a concertina, zig-zag like like pattern which gives strength to both sides of the box. This is held in place and secured with a layer of paper on either side which is called the fluting. Fixed in place firmly with strong adhesive, it can be made of different types of paper such as Kraft or Test, and it’s these outer layers that keeps the corrugate securely contained inside. For more information about the inner liners and fluting, take a look at our beginner’s lesson in corrugate cardboard and cardboard in a recent post about cardboard box disposal. So, exactly when was corrugated cardboard invented? Its history goes back a long way – the earliest reports of it being patented were in England in 1856. Although it was not thought of as a packaging material at the time and was mainly used for other things such as hat lining! The first recorded packaging and shipping patent for corrugate was in the United States and issued on December the 19th, 1871, where it was used for wrapping bottles and glass lantern chimneys. In the years that followed it became a popular packaging material, with wooden crates and boxes replaced by corrugated paper shipping cartons from the early 1900s. With the development of this resourceful material, cardboard boxes could be readily made for reliable shipping and storage, but how are cardboard boxes made? 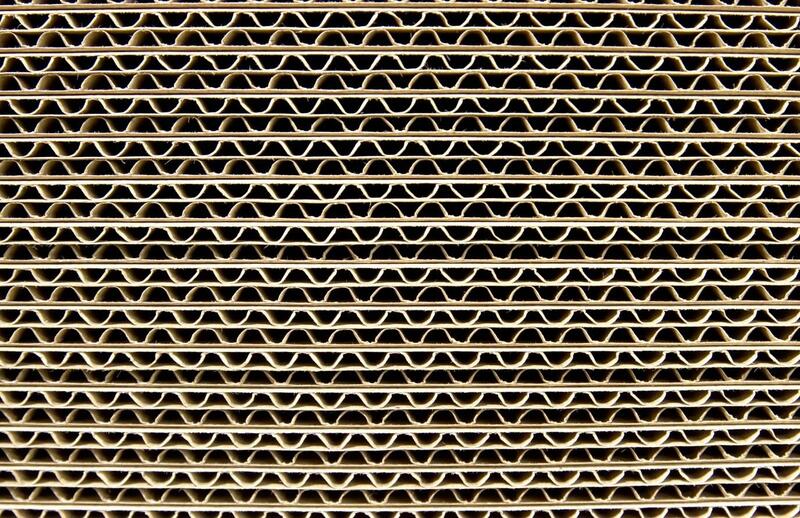 The process begins by making the inner corrugated board – this is done by a large machine called a corrugator. Board is fed into the corrugator, heated and pressed into the concertina form that we see above – this forms the central filling of the cardboard box wall. Two outer liners, the fluting, are then fed through and securely glued to the corrugate using very strong adhesive. Once the glue is set using steam, the flat complete board can be cut into large sheets of various sizes which are used to form the flat packed cardboard boxes that you receive from your packaging supplier. At Rajapack we stock over 600 different sizes and types of cardboard boxes , so you can imagine the cutting and loading process can become quite complicated! 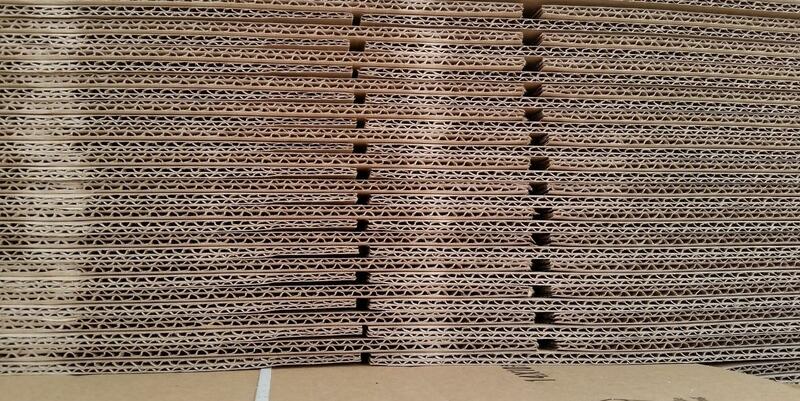 What is corrugated cardboard used for? Corrugated cardboard can be used for various applications, the most common is to house items with the use of a corrugated cardboard box. But first, let’s understand just how does corrugated cardboard work? This innovative construction features three separate materials and gets its super strength from the combination of all 3 working together. In the centre, the concertina card is tightly but firmly packed within two layers of fluting and this gives strength across the width of the card to both sides of the material. It’s this concertina structure that makes the card super strong. With many different types of cardboard box available, we often get asked which is the right one to use, and how thick is corrugated cardboard? The great thing about how it’s made means that many different types and strengths can be produced. Some use thinner, more lightweight materials with a single layer of corrugate for a light and strong box – these are called single wall boxes. Others can use several layers of corrugate made from much thicker card. For these boxes, the material can feel as strong as steel! Our ultimate strength triple wall boxes can support up to an impressive 500Kg in weight, all from a few layers of cardboard! We already know that corrugated board was patented for use as a shipping material in 1871, and this was for single side, single face corrugated board with one layer of paper on one layer of corrugate. But who invented corrugated cardboard? The patent was registered in New York City by Albert Jones – you can actually see the first patent for corrugate as this is hosted online, along with the description and technical information registered – a fascinating piece of packaging history! Why is corrugated cardboard so strong? Corrugate cardboard is so strong because of it’s internal structure, and this contributes to the same reason why corrugated cardboard is a good insulator. The main strength of corrugate comes from it’s concertina like zig zag shape. Being contained within fluting by strong adhesive, cardboard is strongest along the length of the material and it’s this structure that gives it strength to support both sides. And all between the fluting air is trapped and cannot move around, the layers prevent the air from escaping making it a poor head conductor. Corrugated cardboard is recyclable, for additional information on Rajapack and the environment why not take a look at our environmental FAQs and read on. As a packaging provider we must be mindful of how our packaging materials can be recycled and in an environmentally responsible way. So, is corrugated cardboard biodegradable? The good news is that yes, it is biodegradable. It will break down in the environment over time, though it can take a long time depending on the environment that it’s in. If it’s wet and broken up into small pieces then it will degrade much faster, so if you have a compost bin at your home or business then cardboard can be a great addition to your compost. Boxes can be quite large once broken down particularly if they’re pallet or export boxes. If you don’t have a great deal of space to store them on site in between recycling collections, then you may wish to shred your cardboard. If you want to know how to shred corrugated cardboard, it’s simple and straightforward. You could use an automatic cardboard shredder which perforates and converts corrugated cardboard into a strong, shock absorbent netting material which can be used as packaging. Alternatively, you can shred it manually by soaking it in water which makes it very easy to tear and cut through with normal scissors if it’s single or double wall. For triple wall, you might need something a little stronger like a box cutter detailed below, or some industrial scissors that offer more strength. Even though it does break down, it’s always our preference to recycle cardboard when you can – all our boxes are made from 75% recycled fibres on average. Local recycling collections for paper and card are usually frequent and the recycling loop for corrugate is so efficient that used boxes can be recycled, remade and reused in just two weeks! 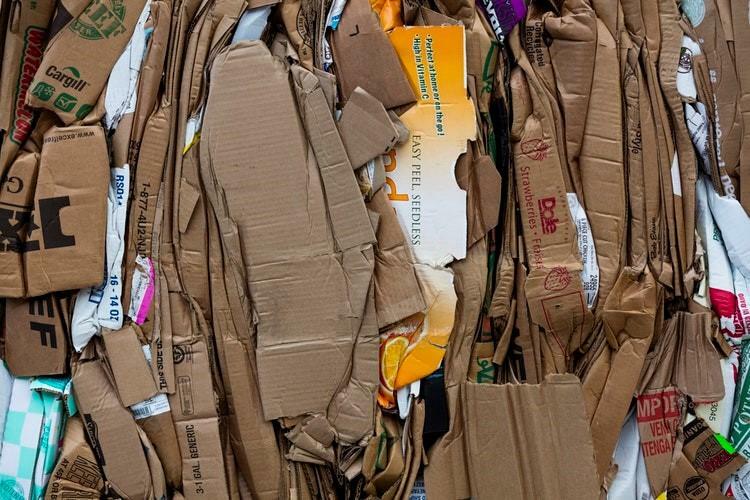 Cardboard recycles very well, without loss of strength or rigidity so it’s an excellent material to recycle. Corrugated cardboard is also great to use for packing – placing in boxes to separate items to hold them securely in place. The fact that it’s lightweight, easy to handle and cut means it’s perfect for many different uses. If you’re wondering how to cut corrugated cardboard then don’t worry, it’s easy. A small cutting knife, called a box cutter will do the job with ease and glide through corrugate easily. Finally we’re looking at non-corrugated cardboard as an alternative. Non-corrugated cardboard is exactly the opposite of corrugate as you would expect! In this material, cardboard is simply layered on top of each other, in the similar way to how puff pastry is made. This can make the cardboard material smoother, so it’s good for printing striking visuals or designs onto. It’s mainly used for lightweight products, presentation boxes and you may have encountered it in things like iPhone boxes or for other gadgets. Generally, it’s not recommended to be used as a serious packaging material, though can be cheaper than corrugate due to its simpler and more lightweight construction. If you’d like more information about corrugated cardboard, our range of cardboard boxes and packaging supplies, or help on selecting the right cardboard packaging for your business, get in touch with our team of packaging experts who will be happy to help. Simply visit www.rajapack.co.uk or contact our team on 0800 542 44 28, or sales@rajapack.co.uk. This entry was posted in Environmental packaging, Packaging Products & Materials and tagged business, cardboard, Cardboard boxes, how is corrugated cardboard made, packaging on September 14, 2018 by Rajapack UK.